Welcome to Mitico Hostel. This is your home in Valparaíso. In 2013, we came to life with the desire to connect travellers from far away lands to the unique local life of Valparaíso. Our walls are filled with the vibrant energy of the streets and invite you to a one-of-a-kind immersive experience into the city’s culture and bohemian vibe. Here at the center of the city (El Plan de Valparaíso), close to Bus Station and the waterfront of our city we will all enjoy the best that Valparaíso has to offer, near to the live music playing at the local bars to the urban graffiti art that colours our houses. Close to the City Market or Muelle Barón touristic docks. Chill out at our balcony with a view of the O'Higgins Square. And when you do, stay at a place you can call home. We are a YOUNG SPIRIT HOSTEL: if you are looking for a quite, silent and private-focused place, we recommend to stay somewhere else, as a family oriented hotel or bed & breakfast. In oposition if do you want to meet people from all over the world, spend time in a good conversation, share some beers or wine at the evening or discover the city with new friends, stay at Mitico Hostel, this is your place. Walking up and down our streets, you will find some incredible cultural and touristic attractions, such as Wheelwright Boulevard (waterfront), The Market, lovely view-points and charming passages. Come and fall in love with the colorful hills of this World Heritage site situated in Chilean land. We are located in a historical, 100-year-old building, recently renewed to make your stay here as comfortable as possible. Our rooms, both dormitory and private, are very spacious with extremely comfortable beds, and access to 10 bathrooms, each complete with a shower. 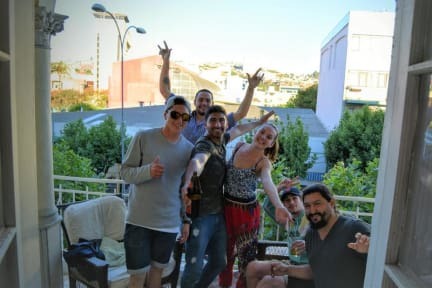 The hostel has three common areas to relax and socialize in, a fully equipped communal kitchen, and a lovely balcony to sit and enjoy the view of the Parliament Square and of the hills of Valparaiso. If you pay with credit/debit card there is an extra charge of 8.25% fee. Allll positive, except for a too small kitchen for so many people. 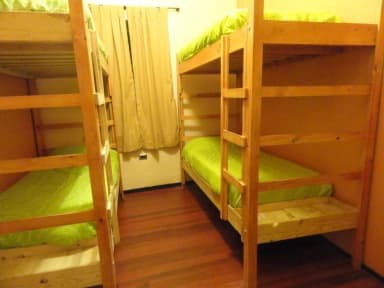 Atmosphere, common areas, free coffee/tea all day, beds, price, cleanliness alllll more than perfect for a hostel!! The hostal itself is very neat and the atmosphere is very enjoyable. Kind staffmembers and interesting guests! The big downside is the location. Its located in a rather dodgy neighbourhood. During the day its fine, but if you go out at night, stick to the Pedro Montt road and bring nothing of value except some cash with you. When I told a local that I was staying here, he insisted on escorting me back to the hostel in the evening. Overall, its a great place in a not so great neighbourhood. i really liked the hostel, but there where a lot of bathrooms but or you could use the toilet/shower or you couldn’t lock the door..